Because we eventually want to end up living somewhere north of Edwards Air Force base in an old B-52 fuselage surrounded by non-running automotive obcsura and trained squirrels, we scan the Craigslist cars and trucks section every now and again. It's our duty now for the future. The search parameters are simple. Minimum price zero, maximum one-thousand. 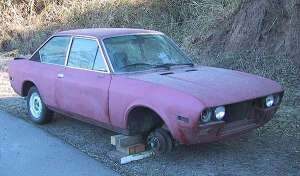 Yesterday's prize winner was this allegedly good running 1973 Fiat 124 Sports Coupe. No bumpers. Cracked windshield. No grille. Shot interior. No headlights. Rust issues. And above all, no dickering! The owner claims that any portion of this fine Italian automobile is worth the entire asking price. All this for the princely sum of 350 bucks.